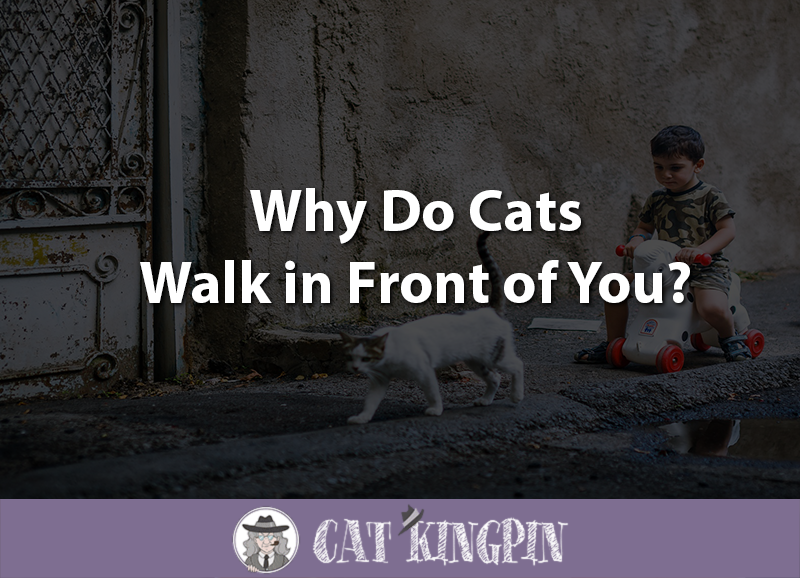 » Why Do Cats Walk in Front of You? Sometimes cats do strange things. From staring at you for seemingly no reason to rolling around after mating, there are a lot of feline behaviors that seem downright perplexing to human beings. One phenomenon that many cat owners notice but struggle to explain is this: cats who walk right in front of you when you’re trying to get from one place to another. They’ll either cut you off completely or weave in between your feet, making it quite impossible to walk without fear of stepping on them. While dog lovers may insist that your cat is actually trying to trip you and murder you, this actually isn’t the case. But why do they do it? Why do cats walk right in front of us? Why Do Kittens Walk in Front of You? Cats communicate almost entirely with their body language. This is true for their communication with their fellow felines, other animals, and their human companions. While many cats will meow to get their owners attention or to express their discontent, the vast majority of their communication is nonverbal. Cats rely on their tails, their bodies, their ears, and their eyes to communicate with the world around them. So when your walking down the hallway and your cat suddenly cuts you off, they’re actually trying to tell you something. This kitty has perfected the art of dancing at their owners feet. She probably wants something to eat! Your cat is walking in front of you to communicate with you. Whether it’s because they simply enjoy being near you or because they’re trying to manipulate you depends entirely on the situation. Cats walk in front of you in order to get you to do something. Whether they want a little bit of attention, need more food, or a refill of their water bowl, your cat is trying to get your attention. And it’s probably your fault! 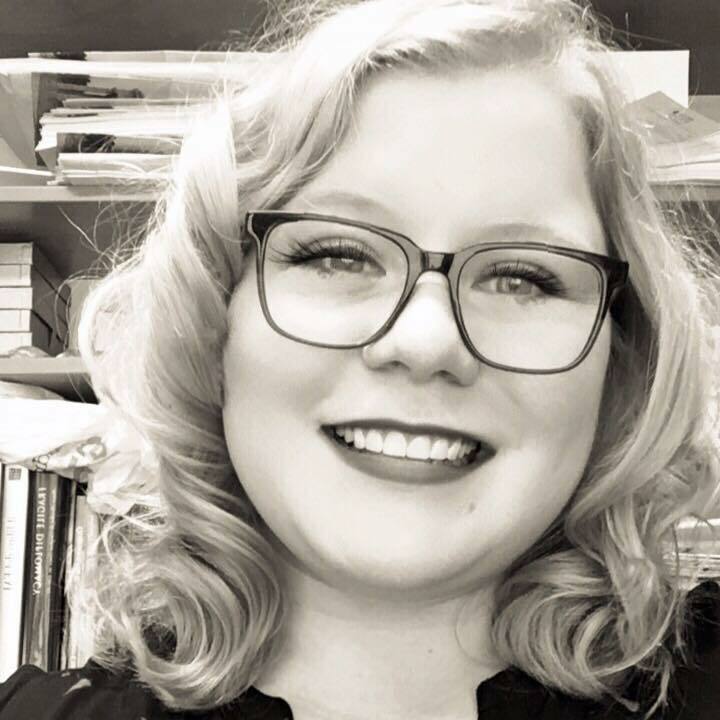 While most cats aren’t “trainable” in the same way that dogs are, cats are highly intelligent and social creatures who learn not only how to read social situations but also manipulate them to their advantage. Long ago when your cat was a kitten, they probably walked in front of you. And because they are so darn cute when they’re little, you likely bent down and petted them or suddenly remembered that it was dinner time and gave them their food. By responding to this action in a positive way (attention, food, whatever) you taught your kitten a very valuable lesson: when I walk in front of my owner and demand attention, I get what I want. Once your cat figures this out, it can be very difficult to break them of the annoying habit of weaving around your legs when you walk and walking directly in front of you. While you may be tempted to give in to whatever they want in order to keep walking without interruption, this may actually backfire. You’d simply be reinforcing the behavior. 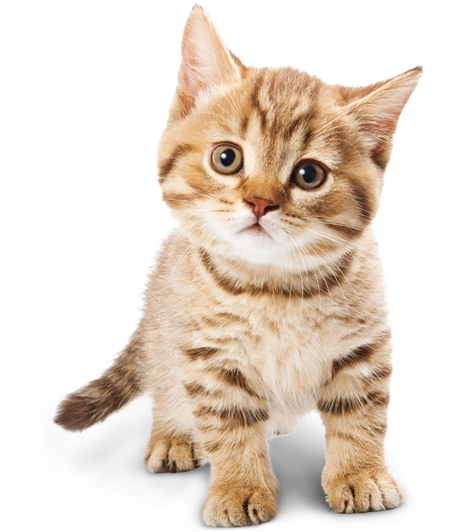 Kittens will walk in front of their owners for the same reasons that adult cats do: because they want something. In fact, kittenhood is the best time to break your kitten of this habit. Kittens are highly malleable and pick up all sorts of habits, good and bad, during this very formative period of their lives. The effort you put into training and socializing your kitten when they’re young will go a long way in raising a happy, healthy, and well behaved adult cat. If your kitten won’t stop walking in front of you, the best course of action is to simply ignore them. Even acknowledging them verbally or picking them up will teach them that it’s a great way to get your attention. While its cute the first few times they do it, having to constantly watch where you’re walking in order to avoiding stepping on your cat will get old pretty fast. There are things you can do to minimize this behavior, but don’t expect the behavior to change overnight. One of the most effective things you can do to stop your cat from walking in front of you is to completely ignore them when they do so. That means no food, no petting, no picking them up. In fact, don’t even make eye contact with them if you can avoid it. Simply keep walking (but careful not to step on them). It’s also a good idea to foster a sense of independence in your cat. While most cats are pretty good at hanging out on their own when you’re busy, some cats are needy and will want all of your attention while you’re at home. To deter your cat from exhibiting unwanted attention-seeking behaviors (such as walking in front of you), you should invest in a few interactive cat toys. These toys, which encourage your cat to play on their own, may help curb their need for constant attention. A great example is the DADYPET Laser/Feather Toy, which is battery operated, rechargeable, and will provide your cat with hours of entertainment. If your cat trips you because their food bowl needs refilling, you may want to consider the PetNet Smart Feeder. This “smart” food bowl, which is controlled by an app on your phone, will help you make sure that your cat always has a full bowl of food. So, why do cats walk in front of you? Cats walk in front of their owners to get attention or to get their humans to do something that they want. Whether it’s a refill of the food bowl or because they want to play, your cat is communicating with you the best way they know how: by putting themselves directly in your field of vision. One of the main reasons for this behavior is because your cat wants to be fed. In fact, you may notice that your cat begins circling your feet at certain times each day that correspond to meal time. If your cats food bowl seems to empty as quickly as you fill it, you may want to invest in an automatic feeder such as the PetNet Smart Feeder. Has your cat ever tripped you? Does your cat walk in front of you in the mornings when they want their breakfast? Have you found the secret to curbing this potentially dangerous and somewhat annoying behavior? Let us know in the comments!